NEW—March 2019: Help shape the next Your Voice Matters survey! Click here to share your suggestions for the next administration. 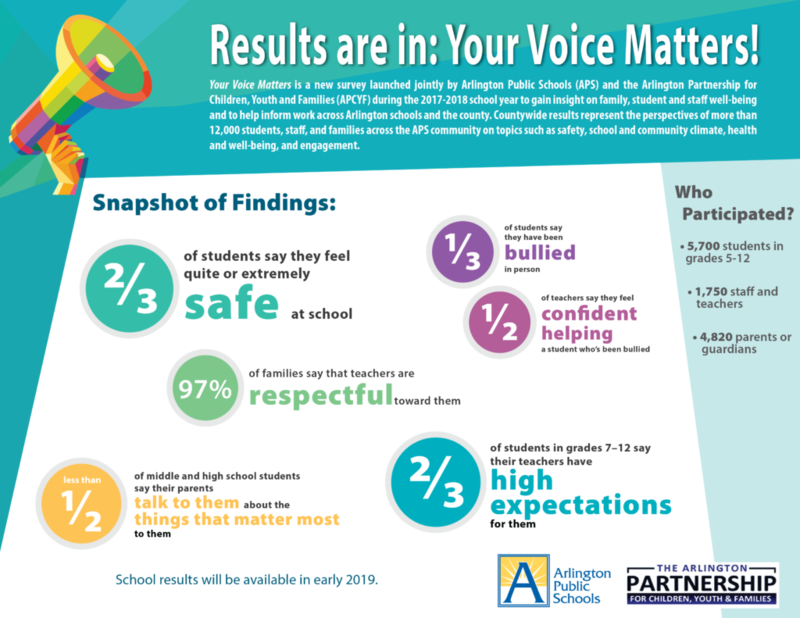 Thank you for your interest in the new APS Your Voice Matters stakeholder survey, conducted jointly by APS and the Arlington Partnership for Children, Youth and Families (APCYF) in April and May 2018. Countywide results of the survey are now available, and school-specific data will be released in January 2019. The Your Voice Matters survey provides insight from more than 12,000 respondents, including APS families, students in grades 5-12, staff, and teachers. Topics included safety (school and community climate), health and well-being, voice, and engagement. APS and APCYF partnered on the survey to gather insight on areas of mutual importance and to deepen understanding of youth and family well-being. The results will be used to inform work across both the school division and the County. The data also provides APS with new benchmarks for measuring progress with stakeholders on the 2018-24 Strategic Plan. The survey will be conducted biannually, and will be administered again in 2019-20. Below are links to the survey results dashboard and an Insights Report, which provides key takeaways and insights summarized by our survey contractor, Panorama Education. School-level data will be added to the dashboard when available.